On a comfortable, rain-threatening morning, about 50 Mature Friends started rolling into the park for our annual picnic. This year we switched locations from Woodland Park, to Meridian Park, which proved to be a vast improvement. Although this location turned out to be more convenient, with parking nearby, fewer people showed up than last year, mainly because of the threat of rain and six of us competing in Paris in the Gay Games. Nevertheless, we sure weren’t hurting for food, as you’ll see in the following pages. 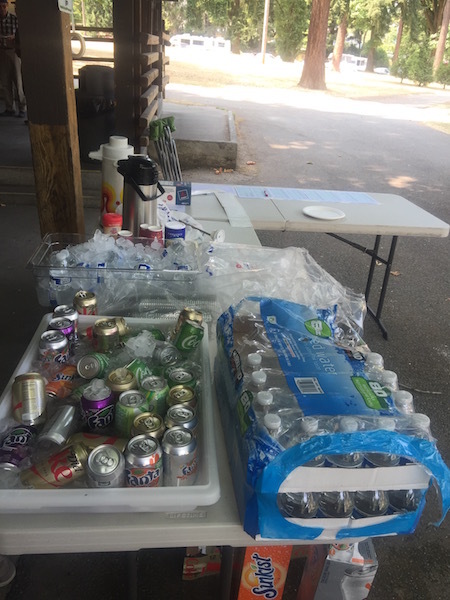 As usual, our president, Bruce, arrived early, bringing along signs, banners, paper for table covering, ice chests of soda, the obligatory coffee urn, plastic forks, knives, and spoons, and all the other supplies that bring a picnic to life. Fortunately, a couple board members arrived early to help him set up. By the time most people arrived, Bruce and helpers had everything set up, down to the details of labeling tables to organize where appetizers, salads, main dishes, and desserts should be placed. 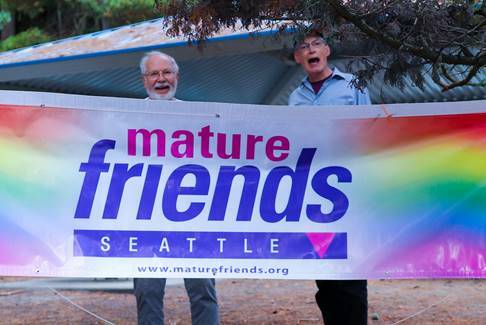 As in the past, the organizers of the picnic also slung the banner in front of the shelter to make sure our members knew they were coming to the right place. Although we don’t collect money for the picnic, we do keep track of how many show up and who contributes food. Because several people had forgotten to sign in last year, Bruce placed the sign-in sheet more prominently to get a more accurate head-count. The early arrivals began picking away at the appetizers and enjoying cold drinks or coffee, hoping the rain would hold off. Around noon, the main group of picnickers began to arrive. The new arrivals set up their dishes to share on the food tables and began joining the early arrivals in feasting on appetizers and whetting their whistles with soft drinks or water chilled down in a tub of ice. Finally, shortly after noon, when this year’s grill-master Peter started grilling the first batch of hot-dogs, Polish sausages, Italian sausages, and veggie burgers, the hungry hoards began circling the main-dish table, ready like a swarm of ravenous seven-year locusts. In the end, the Mature Friends board counted about 50 members who’d come out in spite of the rain and shared great food and conversation. Too bad we didn’t get our usual 80 members, but they can read about the great time they missed. Maybe more next year?